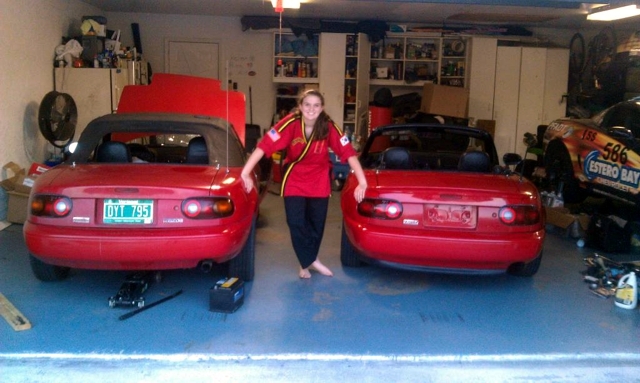 Congratulations to Geraghty Anne on her selection as our Featured MX5 Miata! 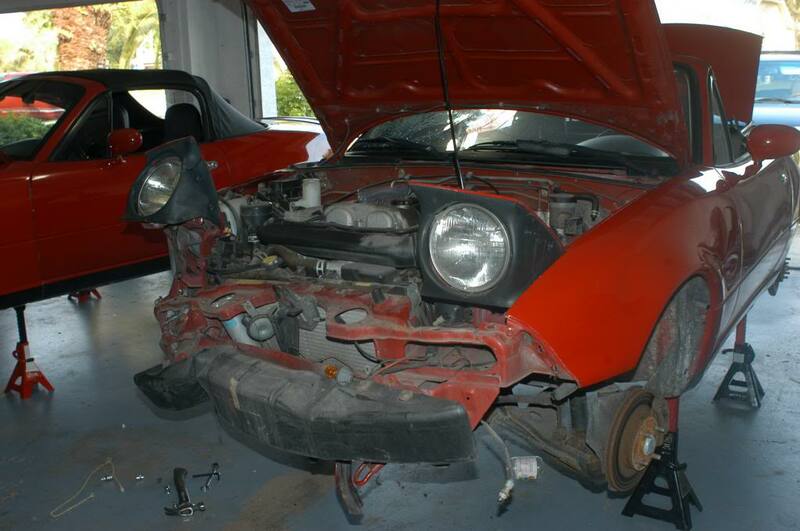 Restoring a car is a complicated, daunting project for even the most experienced enthusiast. Its an achievement for anyone to be proud of. But when that enthusiast is a 15-year-old high school student, we can't help but to be totally jazzed by the commitment and ambition. Geraghty Anne Ellis from Fort Myers, Florida, has chronicled her adventure in her blog. Here are some excerpts from her project, but for the full story, visit her project site. Since I was little, I've been into cars and racing. I used to help wash the cars as an infant (okay so it was more like moral support), and at eight I experienced my first autocross in my Dad's 2005 Corvette. Relieved we didn't explode, I was hooked from the moment we spun through the finish line; minus two seconds for awesome! I learned to drive automatic in Dad's '07 Tundra and manual in the '08 Z06. I plan to earn a degree in Mechanical Automotive Engineering at a college that has a Formula SAE program and hope to work for a supercar company like Koenigsegg. 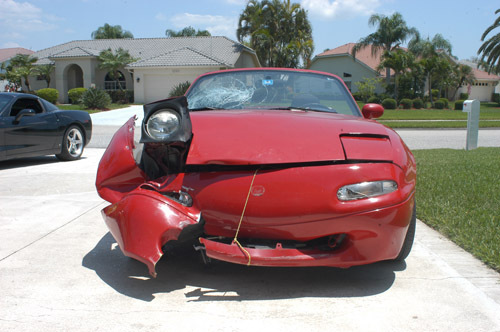 This is the 1996 Miata with a mere 96K miles on it's 1.8L engine and a perfect soft-top and interior - oh, and a dead frog too. The goal is to move it's assets to the 1994 body, including the drivetrain, interior, top, and door handles. This car popped up on Craig's List in St. James City, FL on May 19th, 2014; unfortunately, I was stuck at school while my parents made the deal. 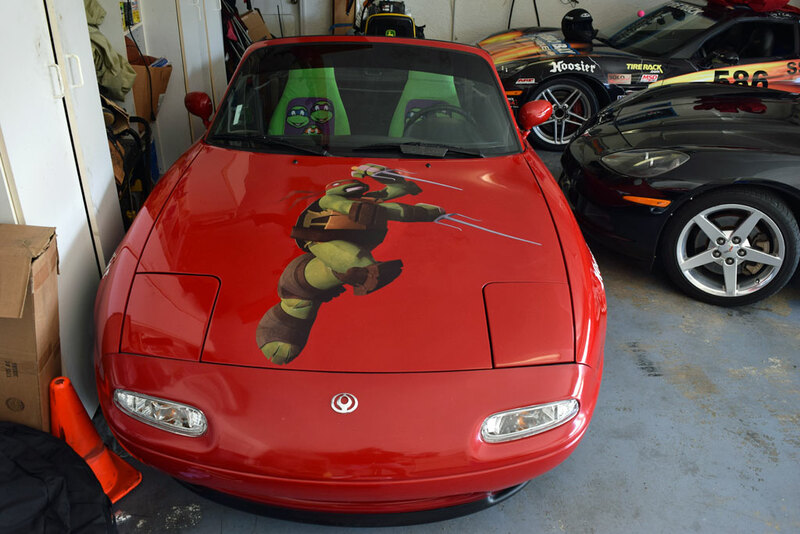 Originally they looked at a disastrous white Miata complete with it's million separate pieces for $1000. Subsequent to that disheartening find, my mom found my current 1996 on Craig's List. They bought it sight unseen, which made me trepidacious becuase the last I had heard prior to the purchase was that my Dad took my money to buy a car without a picture or phone number in it's listing. That afternoon was hectic, but I was ecstatic when my "new" car pulled up, or should I say, was towed up, to the driveway. It's an absolute perfect donor for this project, and I'm glad we pulled the deal off successfully. This is the 1994 Miata shell that will house the guts and glory of the '96. We found the car on Craig's List too, but it turns out the owner knows my Dad and has raced with him in the past. He was asking $1,000 for the car, and I was extremely grateful he lowered the selling price. Today, Dad and I discovered why the '96 would't start - the main fuse was blown and practically melted into the fuse box; we switched it with the one in the '94 and plugged in a working battery. As I turned the keys, the engine roared to life. Zoom, Zoom! I drove a bit around my neighborhood, styling with my dragging fender, cracked glass, blown airbags. Dad bought the second set of jackstands, which we'll use to lift the '94 in parallel. In the mean time, he needed them for his Z06, as the starter and alternator are dead. He'll be replacing those tomorrow. Like father like daughter. :) Our garage looks like what you might see at Daytona in February. LOL Mom is not the happiest since her SUV will be banished to the driveway for a month or two. Today I jacked up the 1994 shell and took the tires off. The rims are rusted, and those tires will get chucked; however, I'll probably use the green lug nuts over the chrome ones for an eclectic feel. With the rest of my wrenching time, I started taking apart the front of the '96; first to come off was the front passenger fender, damaged by the car accident. Afterwards, I unbolted the front facia, a part I plan to keep and set next to Dad's Z06 facia from his Bay Bottom Crawl bush enounter. I also removed the impact bumper and tried to take the rest of the metal framework off, but after practically six million nuts and bolts, I figured it was attached to the rest of the framework. Since the '94 headlights are missing, I removed the '96 headlights to put in the shell. Additionally, I disconnected the horn, drained the radiator fluid (which smells a lot like Pine Sol), and disconnected the radiator hose. Four hours later, it's time to call it a night; I can smell the pizza! Today was a "destruction" day. As the engine is ready to be pulled out, the borrowed hoist came today. Boris helped me remove the left rear axle nut with the assistance of extreme high tech equipment such as hammer and torch. We removed the lower control arms and axles, successfully took out the shock and spring, and also detached the drive shaft and the exhaust and catalytic converter. The differential and drive shaft support brace came out after I disconnected the wiring. Unfortunately, there's a pin in the dif, so it's not a torsen, only an open. I unbolted the center console to examine the shifter boots which need to be replaced. Mom picked up the '94 sway bars from the previous owner, and I found more change in the '96. The windshield is much less valuable now than it was this morning as my father and uncle found humor in smashing it with their fists. :) Great plans for next weekend! 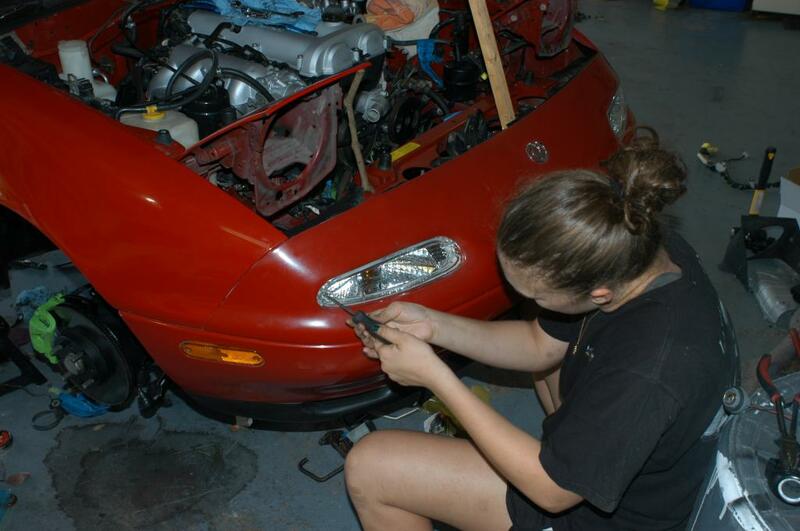 Today, since the electrical work is at a hiatus, Dad and I worked on many cosmetic components of the car. I removed the seats from the '94 and '96 and plan to switch them as the '94 seats are ripped; however, due to the fact that the '96 was previously in a flood, the bottoms are really rusted, so we waited to put any seats back in. 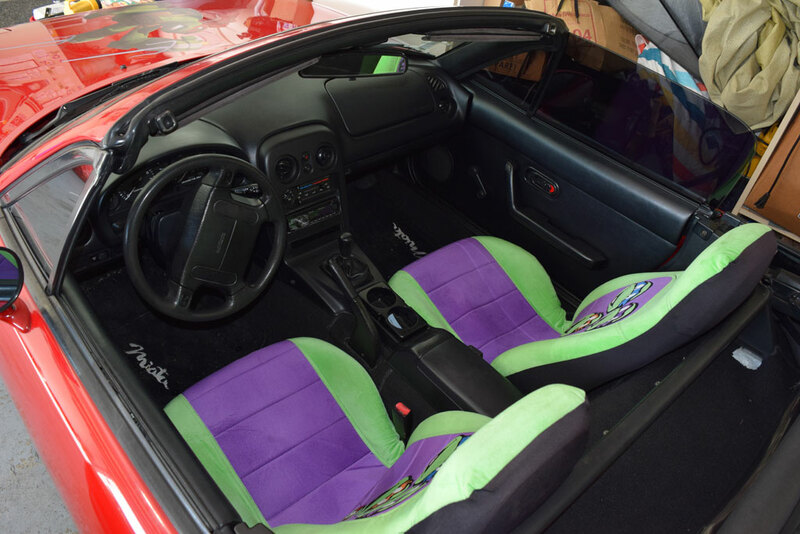 When I took the seats out of the '96, I found: beef jerky, sun tan lotion, a golf score card, a letter from the IRS, french fries, and a bunch of change. On a humorous note, Dad fits in Miatas with some difficulty, but without any seats, he fits wonderfully! Additionally, we reconditioned all rear sub-frame suspension parts, including control arms and axles and painted them a glossy black. I also finished painting the springs green and packaged them with the shocks to be compressed together. Everything is starting to come together! The car is really starting to look like a car again. Today we got the gearbox and drive shaft mated to the engine and differential. We got the rest of the dash in and steering wheel on; I installed the nicer speakers from the '96 which required custom holes. While I finished the driver's door, I lost the black electrical tape (for wire splicing), so the passenger door must wait until tomorrow. Today I successfully installed both rear axles and shocks, meaning the rear suspension is viturally complete with the exception of the swaybar. We had to make a run to Autozone to get a new A/C condenser and accumulator, saving $20 because racecar.. I mean rewards card. :). I planned on installing the rear swaybar, but ran out of time before Tae Kwon Do, and I lost some time when we tried to go to the store because Dad's Vette window shattered by some unexplainable force of magic and sorcery. Today Boris came over and we made a lot of progress! With his assistance, we fabricated mounts for the condenser and accumulator and attached the fans to the radiator via, wait for it.... industrial zip ties! Now that the radiator is installed, the engine bay looks great; all the wires are in place and, although I had to remove the intake, it wasn't a big deal. Other than that, we tried to fire up the engine, but unfortunately the '94 fuel pump wasn't sending fuel up to the engine, so I spent two hours researching which wire controlled what until I realized I had a .pdf version of the manual and found what I was looking for in two seconds. Boris attempted to troubleshoot, but Dad's battery voltage meter device was defective, so we called it a day. On a positive note, using starter fluid the engine sounded AMAZING, so I'm looking forward to getting it at 100% functionality. 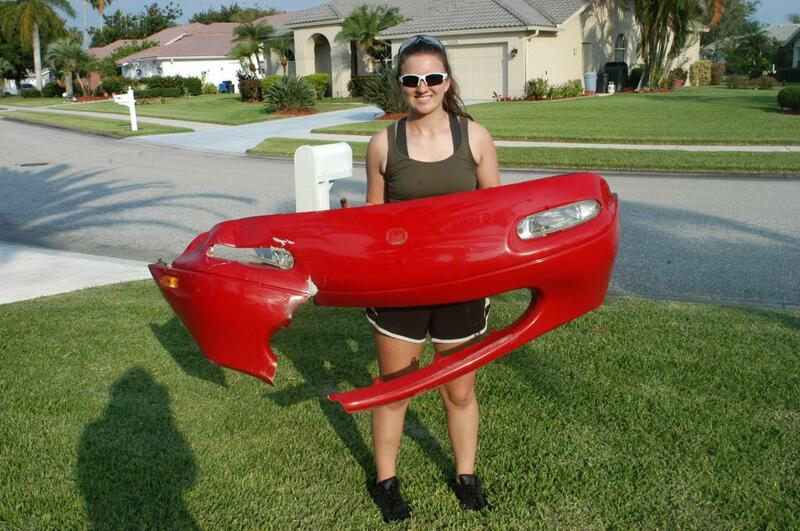 While I turned into a storage platform of sorts, I did sell the rear bumper cover and license plate frame (which was cracked) for $75. First drive was a bust! :( Depressing the clutch would not allow me to engage a gear. We texted Boris and he said to bleed the clutch, and replace the hardware if necessary. We blead the clutch and it made an improvement, but I think we're going to have to replace the slave cylinder. We'll do that tomorrow. Regardless, I WAS able to drive my car for the first time. It was awesome! After my short drive, I went ahead and washed the car and waxed it. The windows don't mate up very well with the roof, so I'll have to look into that as well. The project is complete. The only component that they did not get working was the airbag system, and they basically abandoned worrying about it, as they had no desire to remove the dash again. They also bought a 2015 Subaru BRZ for a daily driver, and now Geraghty Anne gets to keep her baby safe in the garage, to typically be driven on Fridays and weekends, in hopes that this minimizes the risk of someone wrecking her. This summer she plans on installing a turbo system, coilovers, racing seats and a rollbar. She's an active autocrosser and this is the car she'll start racing regularly. This past weekend she took her BRZ to the track, but since it's her daily driver, she'd much rather race the Miata. We think that's a wise choice.